One of the ONLY units NEVER RENTED which means the carpets, sofas, bedding, towels and more are fresh, clean and like new condition. Immaculately kept by non-smoking owners and well stocked with all the amenities makes this a true 'home away from home. 4 bedrooms, 3 full bathrooms, comfortably sleeps 10. Private enclosed backyard in quiet location. 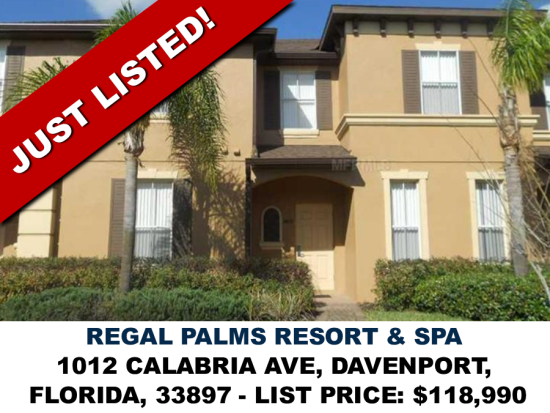 Situated next to the Highlands Reserve Golf Club, and just minutes from the excitement Orlando has to offer, Regal Palms Resort Orlando offers a centralized 24 hr guest reception, resort restaurant and bar, business center, sundry shop, games room, market place, spa and swimming pool area. The unit has a bedroom and bathroom down stairs with its own entrance way so it can be used as a lock out. The Regal Palms Owners Association dues at $210.00/month in addition to basic common area maintenance and reserves also cover pest control treatments (4 interior and 4 building exterior per year through Terminix) and cable TV/WIFI internet access in each unit (200+ channels including HD channels).